Back to Black and Gray! I have to get the taste of my last blog post out of my mouth. And what better way to do it than with more black and gray! This is a self drafted pattern from a RTW garment that my friend Sharon bought in Ashland. It's fairly straightforward. 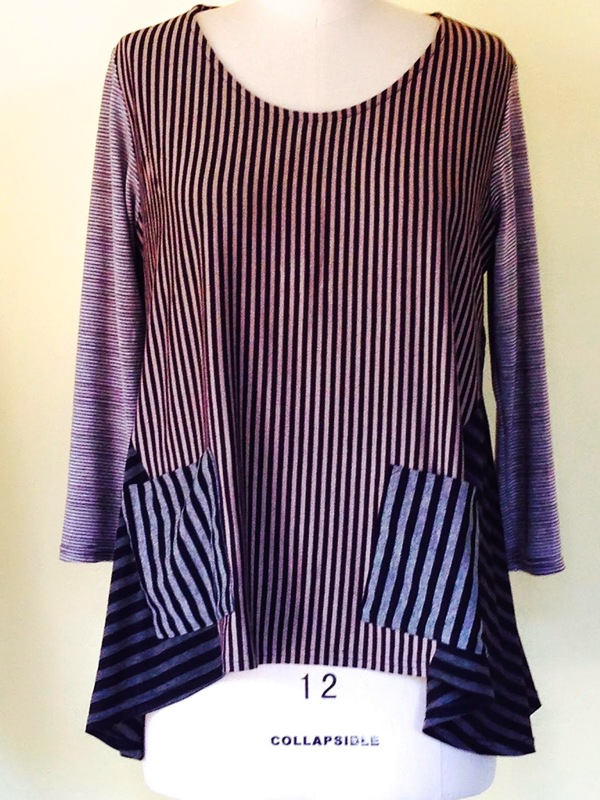 The original was in a lightweight puffy woven but my first attempt was with several striped knit remnants. I forgot to take pics of the back but it's yet another stripe. The armholes were a bit deep and baggy for me so I recut the upper bodice and sleeve parts of the pattern for a tighter fit. 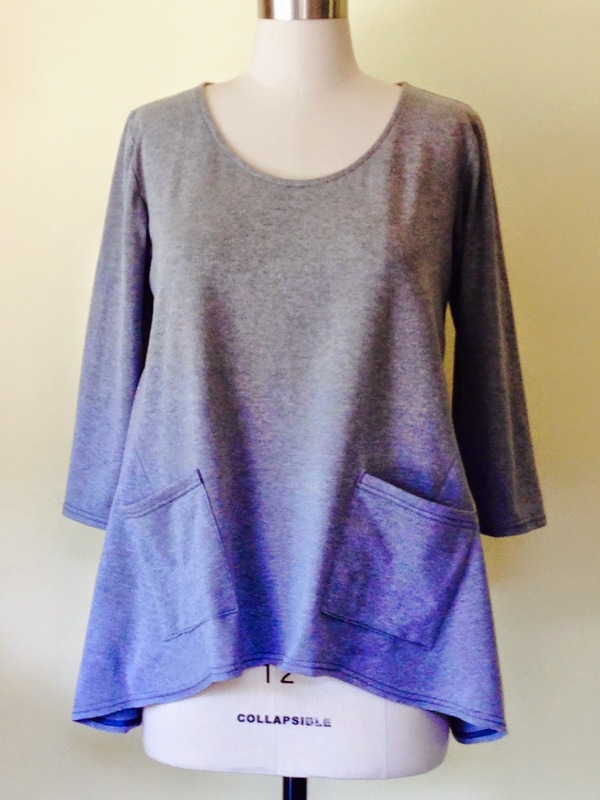 I made it again in this heavy weight heather gray knit. It's not hugely exciting but will be a workhorse in my wardrobe. I love the large godet that wraps around to make a side front and back seam. It makes the tight fitting bodice widen to a flattering drape at the hem. I'm really happy with this pattern. And it had to have pockets. The original only had one. I've never understood that. What's the use of ONE pocket?? This will be a TNT for sure. And here you see a big heap of the muslin I'm working on for my French jacket. I'm almost done assembling it. Pal Jenny is coming over Friday to help me with the second fitting. With these jackets it's all in the fitting. It has to fit like a glove yet give you room to breath. More on this in the future...it's a long term project, worked in-between others. I'm the first one to tell you that my sewing is not perfect. I love the process and always...well almost always...try to do my best to make a garment look as good inside as out. But I almost never achieve that. I call myself a recovering perfectionist since in my professional life I have been tireless in getting things right. But the truth is I've never been able to knit or sew with any consistent accuracy. I've knit dozens of socks. Not once have any two socks in a pair matched, even if I knit them at the same time! Same goes for sleeve lengths. Don't think I'm complaining, I'm just explaining that I know my limits. I work on improving, I do. Right now I'm hand stitching an Alabama Chanin wrap that is really challenging my hand sewing skills. It's good for me. And I'm slowly working on that French jacket pattern. 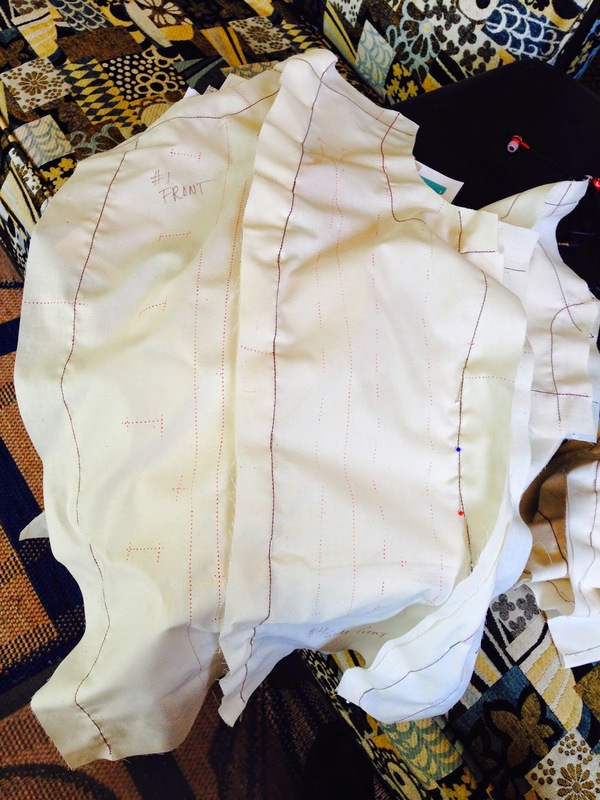 I have the muslin seam lines trace-stitched and am beginning to pin the pieces together. Slow sewing, precise sewing...my new mantra. And...I'm having a blast. Love challenge. That's the intro to showing you two things I'm not so happy with. I told you a while back I'd show you an epic fail and here it is. This is a Tina Givens Luella Top. You might want to put on sunglasses lest it pokes your eyes out with the color! On a recent trip to Nashville I ran across a wonderful fabric store, Textile Fabrics. Huge selection, wonderful fabrics and a super friendly/helpful staff. As you may know, I love black and gray. But I've been trying to branch out when possible and I thought a summer top would be the perfect opportunity. So of course I picked this melon-pink number. It's NOT as bright as it looks in these pictures but let me tell you, it's a lot of pink! I tried this pattern once before with a heavy tan and black stripe. It was too small and the bodice was not flattering on me. But I thought it was the fabric and size I had chosen. Oh, will I ever learn? I got this one made and the same thing happened. The v-neck area just looked horrible on me. So, I began making tucks/darts vertically down the front starting at the shoulder and neck. That brought it in nicely but left little puckers I just couldn't live with. So I went to bed asking the sewing goddess to give me a solution. And she did. She said, "Make a fabric necklace to cover the puckers and sew it right onto the bodice!" I listened to her and here's what it looks like. I think it's made for the young me who was free-wheeling in San Francisco in the early 70's. I might audition it with white gauze capris one hot summer day (who am I kidding, I live on the central coast of California and we really don't have those) or it might just never get worn. The neckline jewelry technique was fun to make. I think it's worth exploring again. I made a template of the design, cut it out and backed it with a lightweight fusible. I then stitched it on with Pearl Cotton. And I'll throw in a little boo-boo lagniappe, just because I'm so nice! Here you see a pair of slippers I learned how to make from Gwen Spencer (love that gal!) at the DOL Ashland retreat a week ago. I was laid low by a knee injury during the retreat so never got the chance to go through the pattern with her at the time. So when I got home it was the first thing I tackled. I had to check in with Lisa Ford, my DOL travel pal, to ask a couple of questions but they are pretty simple to make. I love them but for one thing. It's the old sock problem. You'll notice how I took the picture so that the bottoms are cut off? That's because one is too big and the other too small! I did it again! I'm hopeless. But I do love them and will wear them after fixing the one that is too long...can't do anything about the one that is too short! 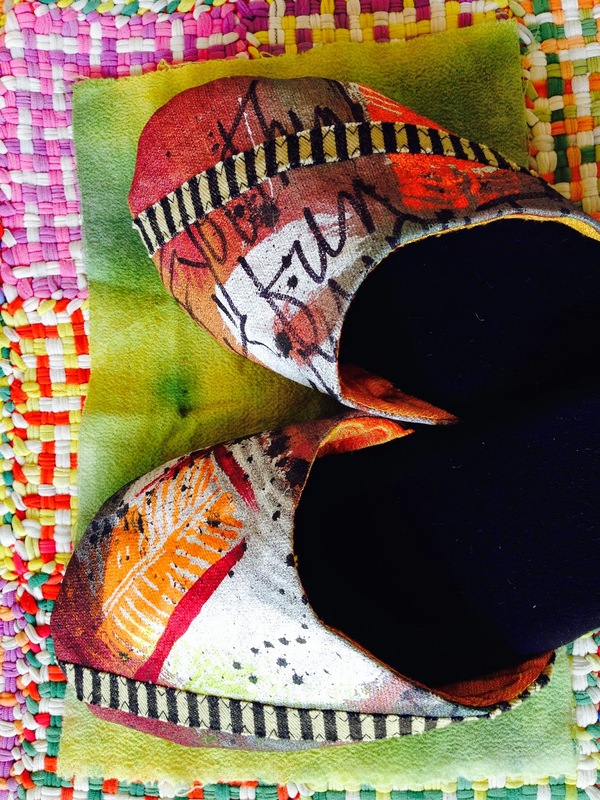 They are made from the same painted canvas I make my purses from. A bit of tan and black stripe stitched on for contrast...oh yeah, it's the SAME fabric I used on the first Tina Givens top! I like how that brings the story back to it's beginning! I'll soldier on, trying to slow down my process so as to get it right more often. But in the meantime I'm going to continue to have a blast sewing.